Happy Friday! Today I am sharing with you a card I made using my fun stamps from Great Impressions. 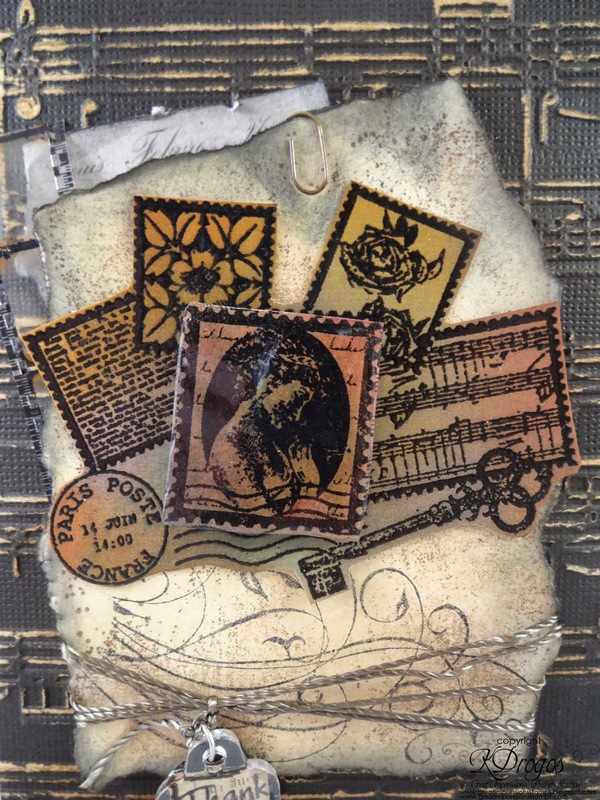 I used the following stamps: Simple Elegance H185, Romantic Collage H147, Distressed Background K94, and Tags G483. 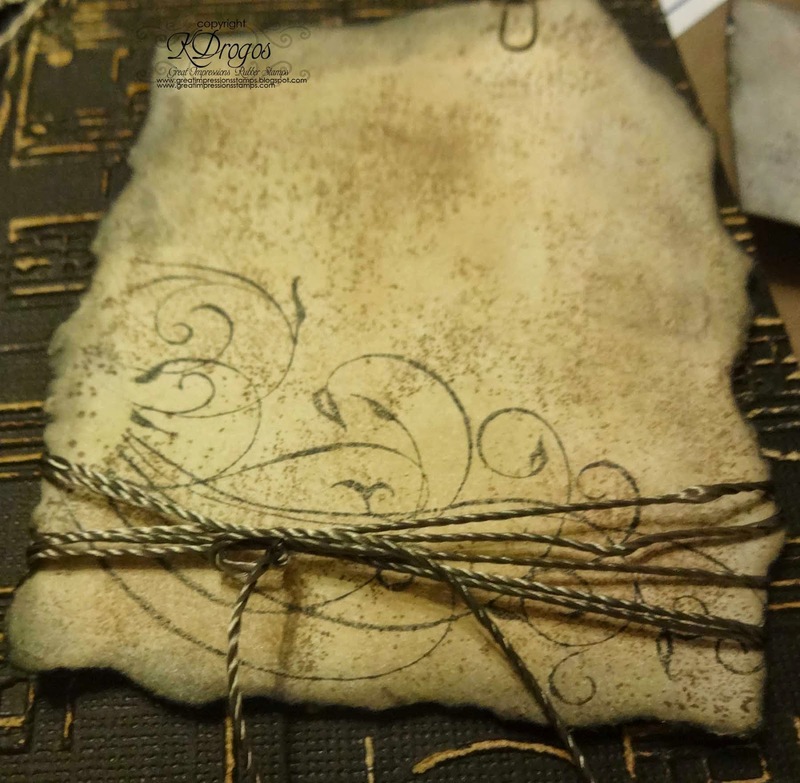 Here is the distressed background stamp (love it!!). I used Tim Holtz's distress inks for this card. So here I used antique linen and then used the stamped with walnut ink. I used black soot around the edges. The paper was a beige color to start with. This picture shows the antique linen better. Then I stamped the simple elegance stamp. I used black soot but I stamped it on a different paper and used the 2nd stamping here. 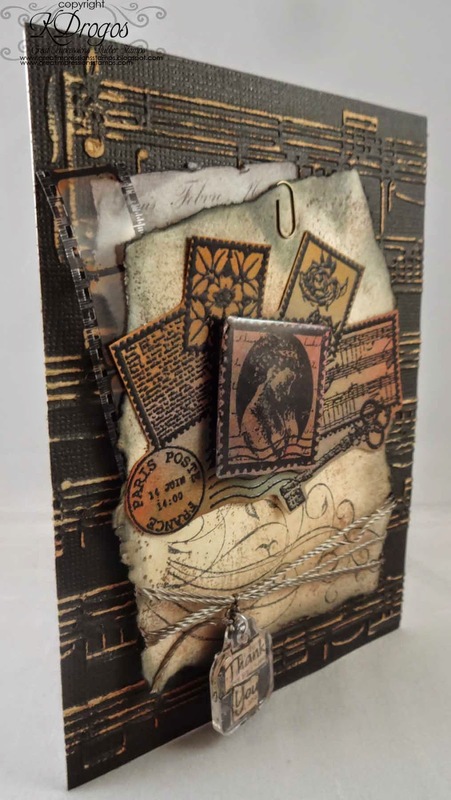 At the top is a Tim Holtz mini paper clip. The cord at the bottom came from a collection called Designer Threads. If you see the Tags stamp, you will see that it is inside a flag. I cut out each word then drew a box around each word. 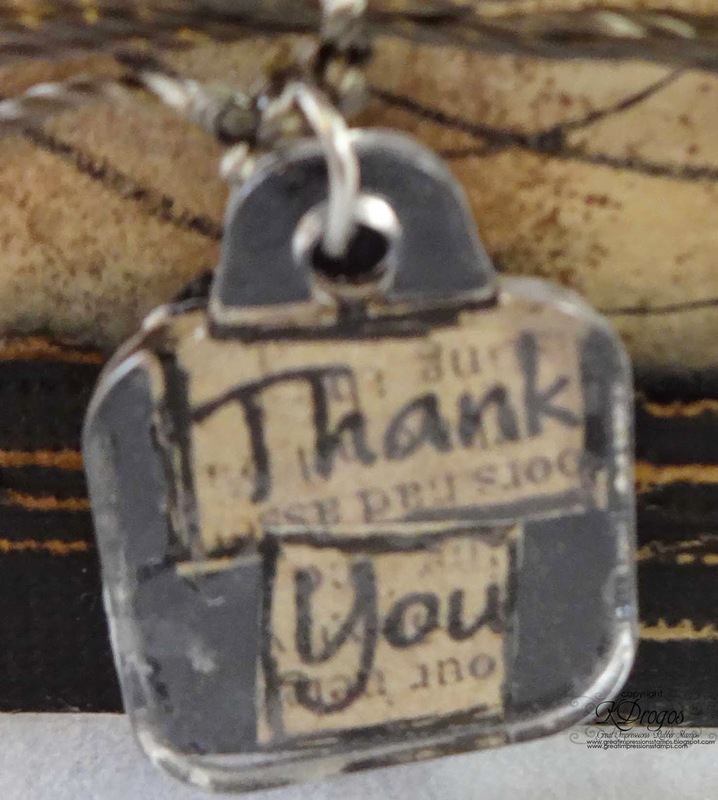 I glued the words onto this Tim Holtz tag and added blackcard stock in the background. I had to add a dot of glue to the know of the thread that I tied the tag with. I don't want the tag to fall off! For the collage stamp I used black embossing powder on a darker beige colored cardstock. Then I used peacock feathers, dust concord, and picked raspberry lightly on the image. I stamped the image again ink black ink and colored it in the same colors. I cut out the stamp with the lady's face and covered it with Glossy Accents. I seem to have rediscovered the epoxy sticker thing and have totally embraced it. :) I used pop dots underneath it. Here is a closeup picture. 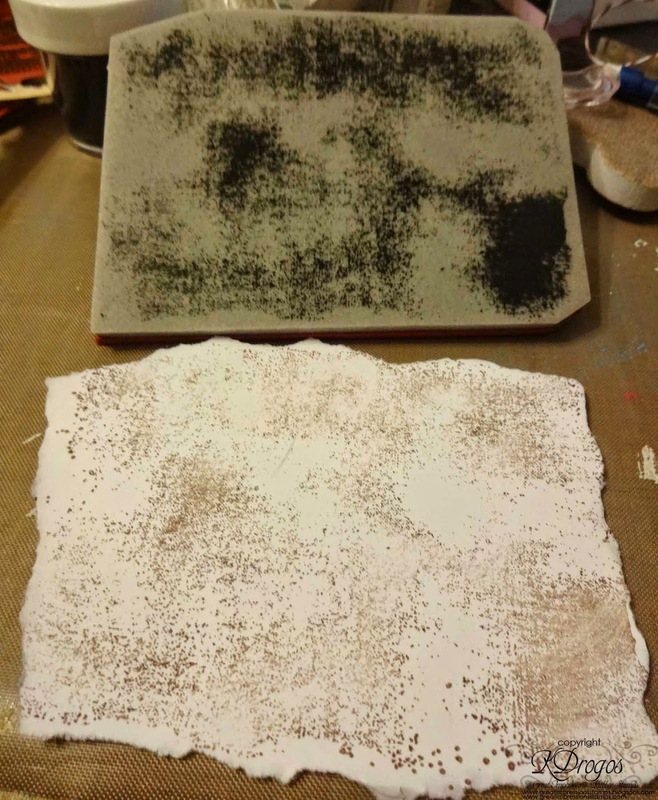 The notes are from a Darice embossing folder and Coredinations paper where I sanded off the darker layer to reveal the lighter layer. I also used Tim H.'s film strip and a piece of his pattern paper behind the main collage. Thank you so much for stopping by! For more inspiration check out our Blog! And don't forget to check out our Monthly Challenge! Incredibly Stunning! I love the vintage feel..Wow! Gorgeous!!!!! I love love love love the vintage look! WOW Katy! 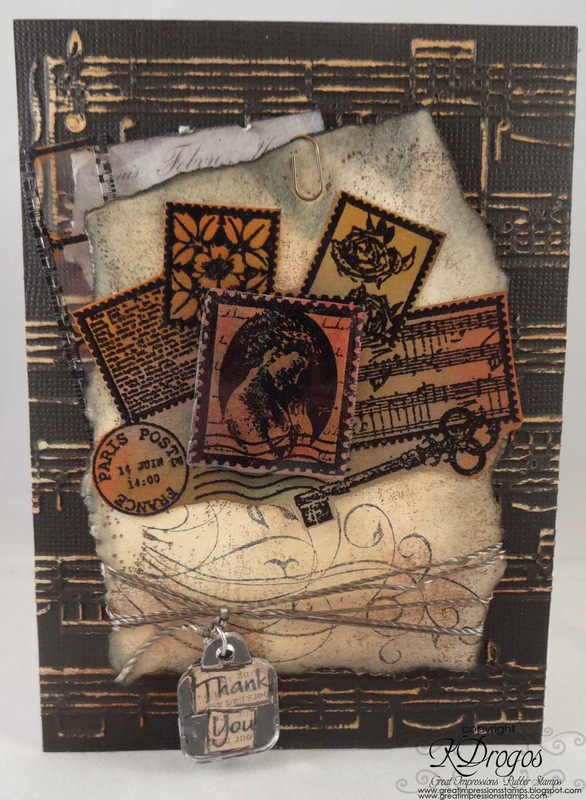 What a gorgeous use of stamps! I have to add a couple more to my growing wish list!